2 Political Junkies: Sgt. Eugene Hlavac Fired From Pittsburgh Police Dept. Sgt. Eugene Hlavac Fired From Pittsburgh Police Dept. It is killing me that aside from the KDKA 11 PM broadcast on 12/24/09, there is no mainstream coverage of this story. 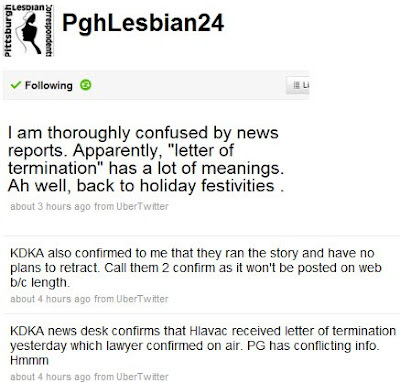 The KDKA story isn't even posted. So frustrating. I noticed that! Glad you caught it. I'm curious if they released this on Xmas eve for a reason. On the one hand, it seems like the only good thing the Mayor's Administration has done in this situation and they'd want props. On the other, perhaps they want to keep it quiet to avoid seeming to capitulate to the women's group? Or perhaps there's more to the story and they want it to go away? Or they are counting on the FOP to reinstate Hlavac so this is just a gesture anyway? Maybe it started out as a leak, and now no one (including the media) really wanted to see the guy fired late at night on Christmas Eve? Just guessing here, I have no idea. It's interesting that that this firing as of yet can't be spoken. My 1st concern is the victim until Hlavac decides how he is going to respond to what's happening. I hope she has gone to higher ground for at least awhile. Sometimes there's a firing and then a legal challenge to the firing... where the pd says it's a done deal and attorney for the accused says the manner in which it was done didn't abide by the required process. We will know soon either way. Police Union president blames anti-domestic violence groups for jaw-dislocating Sgt. Hlavac's woes?